OK, let’s break this one down. The ancient prophet, Israel, also known as Jacob, had 12 sons. Their descendants became the 12 tribes of Israel. An ancient conflict caused the Kingdom of Israel to divide in two. 10 Tribes became the Northern Kingdom of Israel, and the tribes of Judah and Benjamin became the Southern Kingdom of Judah, which settled around Jerusalem. Over the next several hundred years the Northern and Southern kingdoms were conquered and carried away captive by their conquerors. It really just happened once for the Northern Kingdom, but it happened a few different times for the Southern Kingdom, namely at the hands of the Babylonians and the Romans. We believe the Jews, or the Kingdom of Judah, will once again gather to their Promised Land, the Palestine area, (in fact, it’s been happening for some time now). The Northern Kingdom of Israel was conquered by the Assyrian Empire in 721 B.C. Those 10 tribes were taken captive by the Assyrians and scattered throughout their empire. However, the scriptures tell us that at some point a group from those 10 tribes escaped and fled North. We don’t know where they are, but through modern revelation, we believe one day those 10 Tribes will reveal themselves. We believe Zion, or the “New Jerusalem,” is a place where Latter-day Saints will gather and build a city in preparation for Christ’s millennial reign, which starts at His Second Coming. Modern revelation has indicated that the location for this New Jerusalem will be in Missouri, because, hey, it’s got to be somewhere, right? When Christ reigns as King over the Earth, we believe the Earth will be sanctified, or made holy—restored to a Garden of Eden-like state. Christ will usher in a thousand years of peace on the Earth, which we call the Millennium. We’ll have an entire video about the Millennium coming out in the future. That was a lot of information in a short amount of time, so I’ve included some helpful links in the description below that delve a little deeper into these topics. And if you want to know more about what Latter-day Saints believe, keep an eye out for our next video coming out soon. 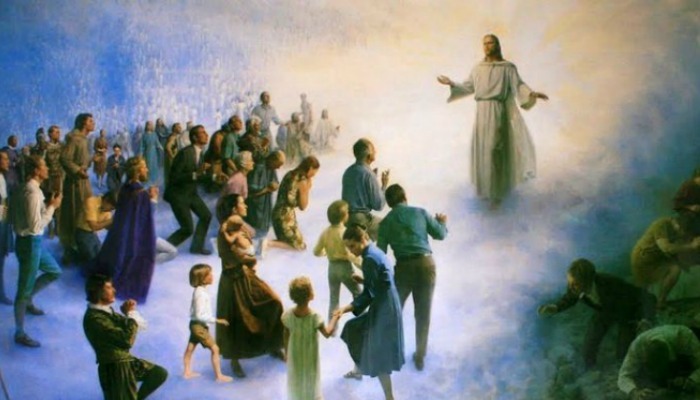 Latter-day Saints share the belief in the Second Coming with other Christians. However, we do not believe in a pre-tribulation rapture, but that the righteous will be caught up to meet Christ in the air when He comes. The Church is doing what it can to prepare for times of greater tribulation. As far as the gathering is concerned, the Church is watching as the gathering of the Jews to Israel takes place. In 1841 the prophet Joseph Smith sent apostle Orson Hyde to the Holy Land, where Elder Hyde dedicated the land for the gathering of the Jews. In 1979 the Church dedicated the Orson Hyde Memorial Garden on the Mount of Olives. Nearby, on Mt. Scopus, the Church operates the Jerusalem Center for Near Eastern Studies, which was dedicated in 1987. But the other tribes of Israel also need to be gathered, and the Church works to spiritually gather the descendants of Joseph. Many members of the Church are descendants of Ephraim (or adopted into this tribe), and the others are from other tribes of Israel. They are prepared by the Spirit to accept the teachings of Mormon missionaries, who seek the pure in heart who are willing to read the Book of Mormon and pray about its truthfulness, and then accept the gospel. Right now, nearly 70,000 full-time missionaries serve all over the world.